Peel garlic and ginger. Juice lime. Add peanut butter, maple syrup, lime juice, soy sauce, ginger, and garlic to a food processor and blend to a smooth sauce. If desired, add some water and blend again to desired consistency. Set aside until serving. Toast peanuts in a frying pan set over medium-high heat. Allow peanuts to cool briefly, then roughly chop and set aside. Bring a large pot of salted water to a boil. Cook rice noodles for approx. 3 min., then drain. Fill a large, deep plate with some water. One by one, wet a sheet of rice wrapper and transfer it to a clean work surface. Top each rice wrapper with some cooked rice noodles, toasted peanuts, soy sprouts, Thai salad mix, and mint. Fold bottom side of the rice wrapper over the filling, then fold in the left and right side. Roll into a log, making sure the sides are sealed tightly. 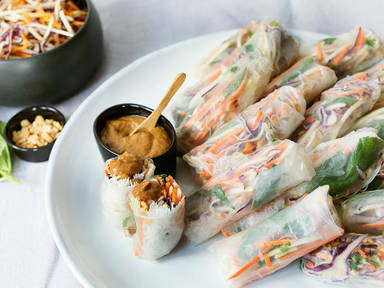 Continue with the remaining rice wrappers and filling and serve with peanut dipping sauce. Enjoy!